Case Western-Reserve University in Cleveland's University Circle neighborhood, has certain schools devoted to medicine, engineering, learning to read and write yadda yadda yadda. But let's cut to the chase: campus is really most noteworthy as the venerable home since the 1970s to a 30-hour annual Sci-Fi Marathon in January. 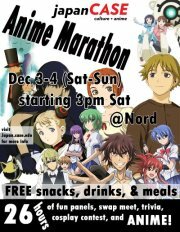 Less famous - but equally deranged, though - are the two 26-hour Japanese "anime" marathons that happen at Case every spring and fall semesters. Yes, Japanese animation will be in full winter-cherry-blossoming this weekend, plus cultural panels and presentations combining the interests of several related student clubs/associations. Admission to the general public is free (though lately donations have been accepted for Japanese earthquake-disaster relief) to behold CWRU tuition money at work preparing young minds for the world of tomorrow - where everyone owns-operates a personal giant robot or mecha suit, or kids duel with magical trading cards or Pokemon, or magic schoolgirl-ninjas with inhumanly long legs and big eyes fight demons while trying to sort out boyfriend dilemmas. These anime marathons, put on by the student group JapanCASE, bring to the campus some of the latest and hottest Nippon cartoon theatrical features, TV serials or direct-to-video releases (or "OVAs," in the language of the "otaku" fandom). The cartoons, many in the original Japanese, fill several rooms, and the schedule mixes them with with trivia contests, panels, Japanese food, musical performance and even an on-campus comedy troupe, the Confused Greenies, doing live parodies of Japanese animation clichés. Then there is the inescapable and ever-popular "Cosplay" in which fans dress up as their favorite Japanimated characters. Dare they wear those same "Battle Angel Aelita" or "One Piece" outfits to graduation and break their parents' hearts? For more information, directions and last-minute updates call 216-368-2000 or go online to http://japan.case.edu or e-mail mmh34@case.edu.